In England’s young silent-film industry, the megalomaniacal Randolph Fflytte is king. Nevertheless, at the request of Scotland Yard, Mary Russell is dispatched to investigate rumors of criminal activities that swirl around Fflytte’s popular movie studio. So Russell is traveling undercover to Portugal, along with the film crew that is gearing up to shoot a cinematic extravaganza, PIRATE KING. Based on Gilbert and Sullivan’s The Pirates of Penzance, the project will either set the standard for moviemaking for a generation...or sink a boatload of careers. Nothing seems amiss until the enormous company starts rehearsals in Lisbon, where the thirteen blond-haired, blue-eyed actresses whom Mary is bemusedly chaperoning meet the swarm of real buccaneers Fflytte has recruited to provide authenticity. 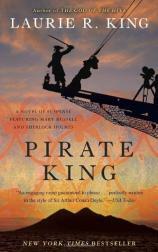 But when the crew embarks for Morocco and the actual filming, Russell feels a building storm of trouble: a derelict boat, a film crew with secrets, ominous currents between the pirates, decks awash with budding romance --- and now the pirates are ignoring Fflytte and answering only to their dangerous outlaw leader. Plus, there’s a spy on board. Where can Sherlock Holmes be? As movie make-believe becomes true terror, Russell and Holmes themselves may experience a final fadeout.